Who is The League of Imaginary Scientists? LOIS is an inventive research collective of Lucy HG Solomon, Steve Shoffner, Jeremy Speed Schwartz, Matt Solomon, and Leonard Trubia – as well as others pulled into the fray. Drawing on the combined creativity of artists and scientists, LOIS conducts everyday experiments with average objects. In pairing science and art, LOIS seeks to formulate new methods for data expression, embodied through interactions that produce physical artifacts and accompanying scientific residues. The League’s process is interdisciplinary, drawing upon collaborators from the fields of art, science, technology, performance, and urban planning. 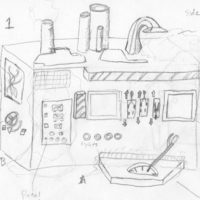 Each imaginary science experiment brings together a new group of creative researchers with the League’s five irregular mainstays. League projects provide opportunities for the exchange of knowledge among collaborators, present and implement a methodology of “art as experiment,” and transform the process of intellectual inquiry into an interactive medium. The League reinterprets established doctrine, inserts experiment as end product, and exercises play as process. After creating art for ten years, what began as a playful art collective riffing on scientific discoveries and communications breakthroughs is now a group of artists coalescing around planetary challenges: such as, how do we achieve ecological balance in a world without environmental empathy? The League participated in the science and art endeavor, e-MobiLArt, and has worked on projects with geophysicists, climate scientists, biologists, engineers and chemists. Our interdisciplinary projects have received support from the Norwegian consulate, the Lovely Weather project, and the Los Angeles Department of Cultural Affairs. A joint iLand residency with EKKO choreography collective, architect Annie Kwon, chemist David Garin, and composer Matt McBane led to the sharing of research practices, with outcomes expressed as guided bike tours, choreographed water taxi performances, and human reenactments of geological events. The League has concocted inventions and performed with media at Electrofringe in Australia and at Århus Contemporary Art Space in Denmark with Emma Nordanfors and Carolina Bäckman. We have edged our way into university spaces like Bradley University with earthquake and entropy engineering. Memorable megamedia include the League’s participatory timeline of the childhood of an entire city in Trondheim, Norway, and the dream assembly line in Tábor, Czech Republic. Our megamedia is at home at our favorite bohemian art space, A Ship in the Woods in Southern California. Public art projects include an interactive city-building project for Rome, Italy in collaboration with Liz Kueneke. Additional commissions include a series of public interventions at the Museum of Contemporary Art in Los Angeles, documented in the text, Engagement Party: Social Practice at MOCA 2008-2012, a community dive into the water archives with the Art Museum of the University of Memphis, actual deep sea dives in Northwest Ireland (in conjunction with the NASA Mars Rover Exploration project), and a participatory coloring film in collaboration with Sundance Institute for Sundance 2017. Degenerative Cultures: Corrupting the Algorithms of Modernity. In collaboration with Cesar Baio. Fungal readings of classic texts in the Biblioteca Classense for Generative Art in Ravenna, Italy: 2017. The Incredible Balancing Act. Interactive installation on humanity’s role in species extinction, in collaboration with CSUSM undergraduate researchers and John Konno, for Balance Unbalance at Plymouth University, UK: 2017. The Social Cinema Machine. Participatory coloring film in collaboration with Sundance Institute for Sundance, with CSUSM and SUNY undergraduate researchers: 2017. Screened at the Alternative Film Festival and the Locomoción Festival in Mexico City: 2017. Postcards from the Anthropocene. Audio postcards to extinct species at the University of Edinburgh, Scotland: 2017. RePangaea. Interactive swim installation at Ship in the Woods in SoCal: 2016. Mechanized Eco-Systems and Ecologically Tuned Instruments. Interactive mechanized devices at Ship in the Woods in SoCal: 2016. Earth: Exit This Way. Interactive performance with post-planetary therapy for Vision LA Climate Action Arts Festival, at the Armory Center for the Arts in Pasadena, CA: 2015. The Incredible Balancing Act. Interactive art works and workshops with students in an attempt to achieve ecological equilibrium, at McNish Gallery in Oxnard, CA: 2015. Distant Yet Connected. Interactive plant life at 643 Project Space in Ventura, CA: 2015. Vague Notions, or Please Befigulate. An interactive visual conversation with FICTILIS, incorporating interactive diagrams and edible pie charts, at Interface Gallery in Oakland, CA: 2014. Time Pools: Accessing the Aquifer. Interactive multimedia installation in collaboration with UM students and the Groundwater Institute at the Art Museum of the Univesity of Memphis: 2013. Model Universe. Physical interactions with the Universe at Space Gallery in Portland Maine and at Llewellyn Gallery in Alfred, NY: 2012. Seeing is Knowing: The Universe: Reach Into a Black Hole. Megamedia construction at the Perlman Teaching Museum, Weitz Center for Creativity in Minnesota: 2011. Entropy and Earthquakes. Residency at Bradley University in Engineering and Art, with an interactive exhibition at the Hartmann Center for the Performing Arts: 2011. Wormholes; The Automatoggler; The Zephyr Experiment. Public experiments and interactions at the Museum of Contemporary Art, Los Angeles: December, 2010 – 2011. Lovely Weather. Climate Art installation, The Irish Rover: Looking for Mars off the Northern Coast of Ireland at the Letterkenny Regional Cultural Centre in Ireland (and on Mars): 2010. Interactions with Synthetic Biology. Interactive exploration at MIT with Dr. Natalie Kuldell: 2010. The Grafting Parlour. Rainbow Generator and other creative science with The Grafting Parlour collective; exhibited at the Thessaloniki Bienalle in 2009. Esther is Crawling. Interactive installation in collaboration with choreographer Emma Nordanfors at Arhus Kunstbygning in Denmark: 2009. The Conversation Contraption. Communication devices and mechanized interactions in collaboration with Pipp Stafford and featured interactive artists at Casula Powerhouse in Australia and at 6A ARI in Tasmania: 2008. Dream Assembly Line. Dreams constructed by the city of Tábor in collaboration with the League of Imaginary Scientists, at the Cultural Exchange Station in Tábor (CESTA) in the Czech Republic: 2008. Really Real Estate. Campaign to vacate a warming planet at Mutamorphosis in Prague and at the KIPP Gallery at Indiana University of Pennsylvania in 2007; at the Urbana Champaign Independent Media Center in May and Sea and Space in Los Angeles: 2008. Finding Aurora. Interactivities with choreographer Emma Nordanfors and Carolina Bäckman as a workshop at Tanz Fabric in Berlin in December, 2007; at 2008 Milkbar Live International Film Festival in Oakland and Electrofringe in Australia: 2008. The Childhood Machine. Bicycle-powered interactive installation providing Idea Therapy for an ailing Western Civilization; presented at Babel Art Space in Trondheim, Norway in August, 2007; Re.Sonance.007 festival; and at Prototipi Manzoni in Milan, Italy: 2008.
thirty-seven isolated events. Immersive video and movement with choreographer paige starling sorvillo and imaginationandmymother, at the San Francisco Asian Art Museum in January, 2007; at CounterPULSE for the 2008 San Fransisco International Arts Festival in May, 2008. Undone History. Interactive timeout machine and catalog of undone acts, for Command Z at the Torrance Art Museum in Torrance, California in 2007; at Manifesta7, European biennial in Italy in 2008; cataloged in the newmacchina archive of Chronovisors in 2008. Meta-physical. Intitial clinical studies of verbal narcotics; presented by NewTown at the Armory Center for the Arts in Pasadena, California in 2007; cataloged in the newmacchina archive of Chronovisors in 2008; at Manifesta7, European Biennial of Contemporary Art in Bolzano, Italy, with CandidaTV: 2008. A Live Diagram of the Human Condition (an Imaginary Science experiment). Interactive performance with dance company Blindsight and sound artist George Cremaschi at MilkBar 2007 International Live Film Festival at CounterPULSE in San Fransisco in 2007; Electrofringe 2007 and the hybrid arts symposium in Perth, Australia: 2008. Blazar. Study on matter and meaning at The Office in Huntington Beach, California in 2006, Manifesta7 the European Biennial of Contemporary Art in Bolzano, Italy, as part of The Shadow of Frequencies at ex-Alumix, for CandidaTV and cataloged in the newmacchina archive of Chronovisors: 2008. Remote Tea Party. Real-time data interaction at California Institute of the Arts, in collaboration with graduate students, Shane Hazleton, Miwa Matreyek, Jeremy Schwartz, and Jihyun Song: 2006. Dinner Party Series (N-Avatar; Avatar x; Alpha Zuppa). Live, interactive, telematic performance feast in collaboration with Melissa Ramos, Jasper Streit, Rhys Turner, and Francesca Veronesi at the TAFE Gallery in Newcastle, Australia; simultaneously at the University of London and at Performance Space in Sydney, Australia: 2006. Una Ciencia de lo Imaginario (A Science of the Imaginary). Works of Imaginary Science, curated by Camilo Sanchez and exhibited through the Asociacion Colombiana para el Avance de la Ciencia in celebration of the World Year of Physics, at Museión in Bogotá, Colombia: 2005. Park City, Utah: Social Cinema Machine: commissioned participatory coloring film project, in response to the US presidential inauguration, in collaboration with Sundance Institute, at Sundance: January, 2017. Channel Islands, California: STEAM: workshop for AHSIE Best Practices at CSU Channel Islands with geographer Christiane Mainzer on collaborating across disciplines: March, 2016. Roswell, New Mexico: Life on Earth vs. Life on Mars: habtiat-building workshop: June, 2015. Owego, NY: Mind Control Toolmaking: building helmets for human brain / computer interfacing at Signal Culture: June, 2015. Oxnard, California: The Incredible Balancing Act: workshops series with STEAM students at Oxnard College: April, 2015.
signalculture.org: Atom Aton: interactive experiments based on Conway’s game of life: 2013. Los Angeles, California: Imagining the Future of Los Angeles: public interventions and workshops forecasting future planetary conditions at Cypress Park Library: Summer, 2012. Los Angeles, California: Tom Bradley International Terminal Video Art Project (Dr. Stephan Schleidan), 90-foot video mural comprised of several composite screens: June, 2010. Copenhagen, Denmark: Waterways collaboration with E.K.K.O and Paul D. Miller on Human Glacier, performed outside the Museum of Contemporary Art in Copenhagen: November, 2009. Brooklyn, NY: Waterways, a laboratory integrating chemistry, movement and sound on board the Waterpod in Brooklyn Bay in New York: August, 2009. Rome, Italy: Rome’s Mobile Timeline, a bicycle tour and interactive audio archive for The Eternal Tour; created with Liz Kueneke and narrated by collaborators from places around the world named Rome, like Roma, Indonesia: Summer, 2008. Dublin, Ireland: Conversation Starters included in ISEA 2009 bluetooth project on Thomas Street in Dublin, curated by Mike Stubbs: November, 2008. London, UK: The League of Imaginary Scientists in collaboration with the Aether9collective at TenderPixel Gallery: August, 2008. Oakland, California: The MilkBar; an interactive research project into the benefits and dangers of the many varieties of milk: created and performed in collaboration with Merlin Coleman for The Milk Bar #20 at The Biscuit Factory: April, 2008. Manizales, Colombia: El Festival Internacional de la Imagen (Aether9): April, 2008. Geneva, Switzerland: 2008 Mapping Festival (Aether9) at Bâtiment d’Art Contemporain (BAC): April, 2008. Bulgaria: NetUser4 (Aether9) at the International Working Camp: July, 2007. Brussels: Remote Fairytales (Aether9) at Maison d’Art Actuel des Chartreux (MAAC): June, 2007. Geneva, Switzerland: 2007 Mapping Festival (Aether9) at Bâtiment d’Art Contemporain (BAC): May, 2007. Newcastle, Australia: N-Avatar. Telematic work at the TAFE Gallery: September, 2006. Syndey, Australia: Avatar x. Live, interactive performance located simultaneously at the University of London and at Performance Space in Sydney: September, 2006. Newcastle, Australia: Climate Change is Happening, collaborative urban video installation, created and presented in conjunction with Electrofringe’s Sight/Sound/Site workshop: March, 2006. Trondheim, Norway: H2O video installation at Lademoen Kunstnerverksteder: February, 2005. San Diego, CA: alteration/enhancement of an existing physical network – the outdoor lighting system – as a nervous system at UC San Diego: February, 2004. Barcelona, Spain: public art installation at the Centre Cívic: September – October, 2003. Los Angeles, CA: video installation at the Japanese American National Museum: August, 2002. Mexico City: video installation for Catastrophica at La Panaderia Gallery: January, 2002. Communication and Digital Culture, PCAACA, San Diego, California. Presented Techno-Mediation of the Human-Nature Relationship: March, 2017. ISEA2016HK. Presentation titled Mediated Loss, or how data melted my glacier: May, 2016. Communication and Digital Culture, PCAACA, Seattle, Washington. Presented Datastream Earth Witness: March, 2016. American Chemical Society Regional Meeting, California State University, San Marcos. Presented on collaborations in art and chemistry with chemist David Garin and composer Matt McBane: November, 2015. Neolife, SymbioticA, University of Western Australia. Presented Synthetic Tree Limbs and Other Nature Transplants with Antti Tenetz: October, 2015. Literature & Arts Lecture Series, Oxnard College. Presented talk, The Creative Germ: Creativity in Art and Science: November, 2014. TEDxBuffalo. Presented TED talk on Imaginary Science and the Evolve You Machine: October, 2013. COMM Week, California State University, Fullerton. On panel, Revision as Design Practice: April, 2013. SITE, Ventura College. Workshop on Collaboration across disciplines: May, 2013. Univeristy of Rochester. Presentation on the Imaginary Science, including the history and varies uses: March, 2012. College Art Association / ARTspace. On panel, Contemporary Collaboratives and Collectives: March, 2012. University of Rochester / Brain and Cognitive Sciences. Imaginary Science: Interactions and Collaboration: January, 2012. Bradley University. Collections, Contraptions and the Cosmos: April, 2011. Louisana State University. Imaginary Science: resentation on the work of the League of Imaginary Scientists: April, 2011. Americans for the Arts Half-Century Summit on Public Art. Waterways presented as one of the year’s 40 Best Public Art Projects by PAN: June, 2010. Lovely Weather Workshops. Collections, Contraptions and the Cosmos: March, 2010. UCLA Art|Sci. Mapping in science and art at the Eli Broad Center at UCLA: June, 2009. Farmlab. Participatory mapping in art for Farmlab’s public salon series: June, 2009.
e-MobiLArt symposium: Merging art and science; on the collaborative process: May, 2009. Trinity College Dublin: Talk on art and science, Interacting with Research: January, 2009. Santa Monica College: Visiting lecturer for arts program: December, 2008. ISEA2009 pre-symposium: GfP at MIT and the University of Ulster, Belfast: November, 2008. Boston College: Which Way is North? Where Art and Science Intersect; November, 2008. Hybrid Arts Symposium: Live Diagram in ElectroEtre at PICA in Perth, Australia: 2008. Electrofringe: Presentation on inter-media collaborations: October, 2008. Dorkbot Sydney: On Blurriness with Carolina Bäckman in Sydney, Australia: 2008. ISEA2008: Video contributor for collaborative remote media performances: July, 2008. Electrosalon. TEAS Intercontinental Media Arts and Performance Discussion presented online through the Escape Artists in Vancouver, Canada: April, 2008.El Festival Internacional de la El Festival Internacional de la Imagen: Remote participation in Realtime Jam Sessions Workshop presented with Aether9 at Manizales, Colombia and online: April, 2008. The Gerrit Rietveld Academie: Remote participation in intercontinental Cym-directed workshop on real-time performance and Aether9 in Amsterdam: March, 2008. California State University, Northridge: Interactivity and Public Art: 2008. Mutamorphosis: Challenging Arts and Sciences: Really Real Estate™ unveiled in Prague, Czech Republic; organized by CIANT, Leonardo, and the Hexagram Institute: 2007. Samand Íslenskra Myndlistarmanna (SIM: The Association of Icelandic Visual Artists): presentation of works by The League of Imaginary Scientists: 2007. VJ Theory: Let’s Chat – What is Realtime Interaction? Intercontintental networked discussion presented by The Escape Artists: 2007. College Art Association: Documentation from the League of Imaginary Scientists presented by Claremont Graduate University at the Asian Cultural Center’s Asian Fusion Gallery in New York: February, 2007. University of Wisconsin, Madison: Imaginary Science at TRANS Visual Culture Conference: 2006. California Institute of the Arts: Presentation of Imaginary Science art works/ Artist in Residence (Dr. Gomez): 2006. Electrofringe (Newcastle, Australia): Telematic presentation on networked media and streaming technologies at Electrofringe: September, 2006. University of London: Presentation on network (mis)communication at (re)Actor: The First International Conference on Digital Live Art: September, 2006. Cultural Exchange Station (Tábor, Czech Republic): Presentation of Imaginary Science videos and interactive works: 2006. University of Newcastle (Ourimbah, Australia): Presentation of Imaginary Science videos and interactive works: 2006. A Field Guide to iLANDing: scores for researching urban ecologies. The League of Imaginary Scientists, in collaboration with E.K.K.O, produced by iLAND (Interdisciplinary Laboratory for Art Nature and Dance): 2017. UPPERCASE Magazine. Vacation Land Anthropocene – Wish You Were Here! Volume 34, UPPERCASE Publishing Inc: 2017. Visual Communication Quarterly. Hot Air: Data melted my glacier…, Volume 23, No. 2, Routledge: 2016.
pacificREVIEW. Zoologic, in Vivarium Issue, ed. Ryan Kelly, San Diego State University Press: 2015. RETROSPECTIVE: A Decade of Intersections. The League of Imaginary Scientists included in anthology of UCLA Art|Sci presentations, produced by UCLA Art|Sci: 2015. Engagement Party: Social Practice at MOCA 2008-2012. 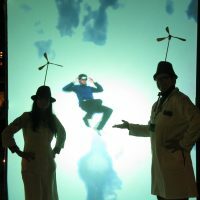 The League of Imaginary Scientists, produced by Museum of Contemporary Art, Los Angeles, 2013.
aether9: Remote Realtime Storytelling, produced by Aether9 Collective. Grayscale Press: 2013. Lovely Weather. Catalog for the Lovely Weather public art projects, produced by Leonardo: 2010. Biennále: 2. Catalog for the e-MobiLArt Cultural Art exhibition at the 2009 Thessaloniki Biennale: 2009. Rise & Fall. Commemoration of the fall of the Berlin Wall with artworks, produced by BOA Life: 2009. Here, There, and Everywhere: Anticipating the Art for the Future. Thing, Part II, Transformed, produced by Transcultural Exchange and the UN Educational, Scientific and Cultural Organization: 2009. Digital Foundations. Really Real Estate™ by Xtine Burrough and Michael Mandiberg, Peachpit: 2008. ElectroEtre. DVD compilation of interactive performance works, compiled by Cat Jones: 2008. Babel 2007. Essay on the League’s collaborative installation, “The Childhood Machine,” in Norway. Resonance.Network.Mission.007. (The Childhood Machine) Catalog and DVD of the third biennial re.sonance.007 festival, produced by sonance artistic.network: 2008. Four Degrees: Artistic Views on Climate Change. Catalog, produced by the KIPP Gallery at Indiana University of Pennsylvania, edited by Robert Sweeny: 2008. (Untitled) u =_____. Catalog essay by the League’s Dr. L. Hernandez Gomez, produced by Fette’s Gallery: 2008. DVD collection of the National Museum in Wroclaw, Poland (in association with WRO 07, the 12th International Media Art Biennale). IMAF 2006. Catalog and IMAF performance documentation archive (Reworld), the Multimedia Art Studio in Serbia and Montenegro: 2006. CESTA archive in Tábor, Czech Republic: Imaginary Science and InterActivities DVDs included in collection. Smith College Museum of Art Collection (gift from Nina Yankowitz): “You Build-it” Telescope Kit) and Sticker Data Set (from Really Real Estate) (2008). California Institute of the Arts library: Imaginary Science and InterActivities in DVD collection. Archive at the Centre for Research and Documentation (CR+D), an arm of the Daniel Langlois Foundation. European Media Art Festival (EMAF 2006) Film, Video, and Interactive archive in Osnabrück. 2005 International Videofestival Bochum in Germany: Works of Imaginary Science included in DVD archive. Incentive Grant for Wild Data and Neighboring Jaguars; GPSM Grant for Environmental Data: 2016, 2017. 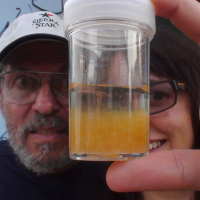 CSUPERB Grant for Art and Science Laboratory Development: 2015-16. Tookmaker residency at Signal Culture in Owego, NY: 2015. Oxnard City Council Arts Grant for Mentor/Mentee Project at McNish Gallery: 2014. AIR Grant, Los Angeles Department of Cultural Affairs: 2012. MOCA residency for collectives: 2011-2012. 2010 Public Art Year in Review: Waterways honored as one of 40 Best Public Art Projects by Americans for the Arts: 2010. Leonardo/OLATS and Letterkenny Regional Cultural Centre commission for climate art in Donegal County, Ireland: 2010. Artist in residence at iLAB, iLAND, inc’s interdisciplinary laboratory in NYC: 2009. Fellowship from e-MobILArt (European Mobile Lab for Interactive Media Artists): 2008-2009. Artist in residence at Lademoen Kunstnerverksteder in Trondheim, Norway: 2007. Danish Arts Council grants for presentation (Esther is Climbing): 2008. Meet the Composer commission for new music and multimedia: 2008..
sitemaping.ch Swiss funding to Aether9 for new development in media arts: 2007 – 2008. Danish Arts Council grants for research (Finding Aurora): 2007. Royal Norwegian Consulate General grant for creative development and artistic exchange: 2007. Artist in residence at Lademoen Kunstnerverksteder in Norway: 2007. Artist in residence at California Institute of the Arts in Valencia, California: 2006. Artist in residence at the Cultural Exchange Station in Tabór, Czech Republic: 2006 and 2008. Artist in residence at the Gunnery Studios in Sydney, Australia: 2006. © 2018 the League of Imaginary Scientists - All Wrongs Reserved.